We approach the anniversary of August 11 and 12, 2017 with complicated feelings. As some Charlottesville residents have already written, the events of last summer left many scarred, both psychologically and literally. Sometimes it can feel like the car attack carried out by the fascist James Fields overshadows a very real victory that was hard won in the streets. Since Charlottesville, we’ve watched fascist movements in the US fragment and collapse. The street power that the alt-right and other fascist groups had been building in the months leading up to August 2017 has disintegrated. Fascist spokesmen like Richard Spencer face resistance everywhere they go; Spencer has complained that doing public events and demonstrations “isn’t fun anymore.” Many of the fascist groups that went to Charlottesville have split up. While the white supremacist right is not defeated, they are weaker, and we can trace their decline to the fights of August 11 and 12. When footage of the car attack circulated, people all over the world responded with resounding solidarity—a show of force that engendered fear in the halls of power as well as among fascists of all stripes. Several continents saw solidarity demonstrations within 24 hours of the murder of Heather Heyer on Water Street. In an effort to calm some of that anger, cities began taking down their Confederate statues, often under the cover of night. People in Durham, NC tore down a Confederate statue themselves, inspiring others around the country to carry out further attacks on statues and monuments. The climate in the immediate aftermath showed a glimpse of the power and cohesion we can have. Our solidarity and commitment to each other were displayed for all to see in the weeks following Unite the Right. It was obvious that those who want to see a world free from white supremacy were more organized and determined than the alt-right. After the window opened by the immediate reaction to Unite the Right began to close, backlash ensued from the state and the far right. Another wave of doxxing, arrests, and legal cases began, along with a grand jury investigation. The police became increasingly violent towards protests against subsequent far-right demonstrations, most acutely demonstrated in the police operation to defend a fascist gathering in Newnan, GA. This only added to the state repression that autonomous and anti-capitalist movements were facing before the Unite the Right rally. Despite all these obstacles, we have seen incredible solidarity and resilience on our side of the barricades of Emancipation Park. Image: A solidarity demonstration in Germany. To remember Heather and everyone who fought to push back the fascist tide of Unite the Right in August 2017, we propose a weekend of international solidarity for August 11 and 12, 2018. 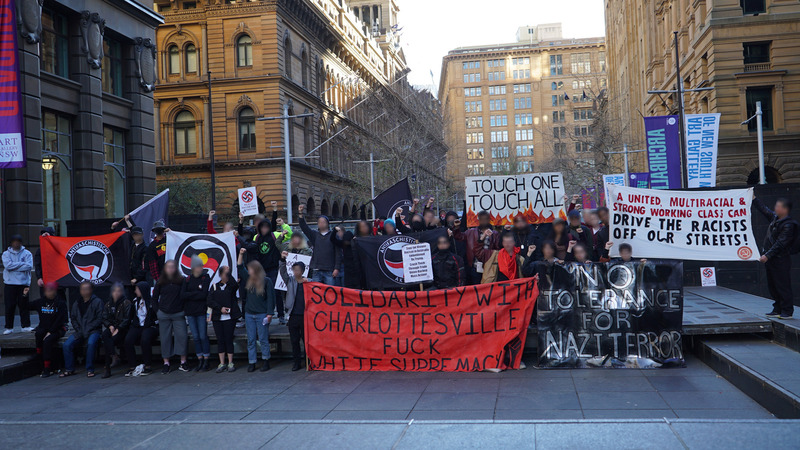 We suggest a focus on visibility—whatever that means for you—to show that despite all the obstacles we have faced compared to the fascists and their police escorts, our movements remain resilient and strong. We know that our ties reach across borders—let’s make those ties clear. The TORCH Network has already called for a day of remembrance for slain anti-racists Dan and Spit on July 4. We should build on that energy to keep the memory alive of those who have died fighting fascism. This is an opportunity to build cohesion locally and transcontinentally. Think creatively about the forms that resistance to fascism and white supremacy could take in your context. Are there active white supremacists where you live who might try to mark this anniversary themselves? What can you do to stop them? How does the world that the far right is trying to create resemble the world we already live in? Which institutions are they attempting to protect? How can you honor those who have suffered most from white supremacy? What gestures might resonate with people you haven’t yet met? You could hold a public demonstration, bringing people together in the streets to express opposition to authoritarianism—whether that be the violence organized by fascist groups or the border control policy that the Trump administration is pushing. You could organize a film screening, concert, or benefit dinner. For example, if you haven’t already showed the movie ANTIFA in your community, this is a good opportunity to do so. You could set up a table full of anti-fascist literature in front of the local metro stop or in a local park and distribute it to passersby. You could put up posters and stickers remembering Heather and others who have died fighting fascism and bigotry. You could hang banners in public places bearing the names of those killed by racists and fascists. Image: A solidarity demonstration in France.